We are very happy with this wall decal and may purchase again for a second house. 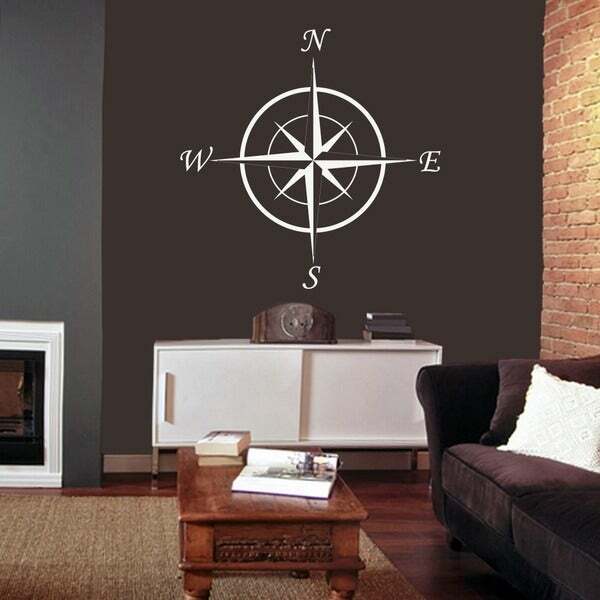 This cool compass wall decal will look perfect in an office, entryway, or living room in your home. Great for the nautical décor, this design will always point you in the right direction. Great for indoors or out, you can also place this on the front of any vehicle, boat, or even on a shed or building. The largest size will come in two pieces for easier application. Feel free to cut your decal apart, arrange and apply as you see fit. Our decals come in a matte finish with the exception of silver and gold, which come in s nice sheen. Each order includes our FREE decal of the month which provides great practice for beginners. The available size describe the decal in its entirety from side to side and top to bottom. This excludes decals that come in packs (see product description for additional details). Our decals are easy to install and remove without damage. Each order comes with detailed instructions, and an application card. We are a family owned business and manufacture everything in Attica, Ohio - USA. In 2007, Sweetums Signatures was born! Made and produced right here in Ohio, we are a small business tailoring to the décor and service needs of our customers. From indoor wall decals to outdoor signage, we are built on core values of hard work, family and delivering on our promises to our customers. We believe that every home deserves a designer look without a designer price tag. Love the look of this wall decal. Put it in my spare bedroom...it really completes the look. It was a little challenging to install perfectly, and it took two days to flatten it out prior to installing, but I persevered, and it was worth it! I have this in a blue and white nautical bedroom this grey walls. Love, Love, Love....It completes the room!!! This was exactly what I expected & easy to install!